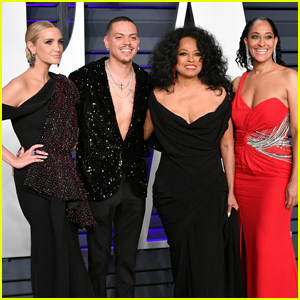 Diana Ross poses with kids Evan and Tracee as they arrive at the 2019 Vanity Fair Oscar Party at the Wallis Annenberg Center for the Performing Arts on Sunday (February 24) in Beverly Hills, Calif.
Also joining the Ross family at the event was Evan‘s wife Ashlee Simpson. Later in the night, the Rosses headed to Elton John’s Viewing Party where Diana hung out with fellow music legends Quincy Jones and Mary Wilson. FYI: Tracee is wearing a Versace dress, Christian Louboutin shoes, and Nikos Koulis earrings while carrying a Lee Savage clutch. Evan is wearing an SSS World Corp. blazer, Theory pants, and Saint Laurent shoes. Ashlee is wearing a Maticevski gown, Lorraine Schwartz jewelry, and Sophia Webster shoes while carrying an Edie Parker clutch. 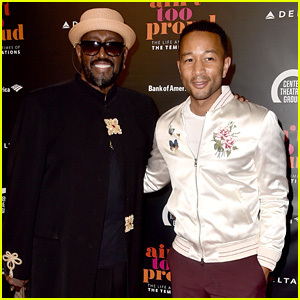 John Legend walks the red carpet with original Temptations member Otis Williams at the opening night performance of the Broadway-bound musical Ain’t Too Proud on Friday night (August 24) at Center Theatre Group’s Ahmanson Theatre in Los Angeles. The new musical follows the life and times of The Temptations and it’s set to open next year at the historic Imperial Theatre on Broadway. Los Angeles audiences can see the show now through September 30 and it’s one you won’t want to miss! Other celebs in the star-studded crowd included Berry Gordy and The Supremes‘ Mary Wilson, who are both featured in the musical, as well as Lena Waithe, Danielle Brooks, Billy Crystal, Lily Tomlin, Corey Hawkins, Debbie Allen, Glee‘s Amber Riley, Young Sheldon‘s Iain Armitage, The Real‘s Loni Love, theatre actress Stephanie Styles, comedian Ali Wong, GLOW‘s Sydelle Noel, American Housewife‘s Carly Hughes, Transparent‘s Trace Lysette, Tina Knowles Lawson with her husband Richard Lawson, and Major Crimes‘ Jon Tenney with his wife, producer Leslie Urdang. Cast members Derrick Baskin, Jeremy Pope, Jawan M. Jackson, and Ephraim Sykes all walked the carpet following the performance!